Home » Blog » How Volunteers Rocked 2017! This post comes from Hanna Davis, our recent Volunteer & Events Manager. Wow! What a year for volunteers at the Community Cycling Center! Our volunteer appreciation party recently welcomed nearly 70 guests to the Lagunitas Community Room to celebrate our work with food, drinks, and a raffle. What’s more, we got the face time we needed to help strengthen our bonds as members of this volunteer community. I received so many well wishes and messages of support from y’all about my transition out of my position here at the Cycling Center, and I’m so grateful to have the love and support of this community! Thank you! 800 used wheels processed by wheels volunteers – and sold in our shop! It’s a volunteer manager’s dream to calculate hours and give their volunteer community an idea of their reach, an idea of just how important their many hours are to our work. Well, get this: IndependentSector.org valued volunteer time at $24/hour in 2016. That means with the hours that y’all contributed, and with the money we received from our recycling efforts, y’all helped us raise the equivalent of $130,000 in 2017. You’re like one big grant. One big grant with 1000 wrench-turning hands. Thank you so much! All of these hours couldn’t have been possible without our co-volunteer leaders, JR Browy, Cole Lalomia, Tyler Pell, and Jim Milne. I thank them, and we thank you. And ICYMI, we’re back on for Tuesday evenings! 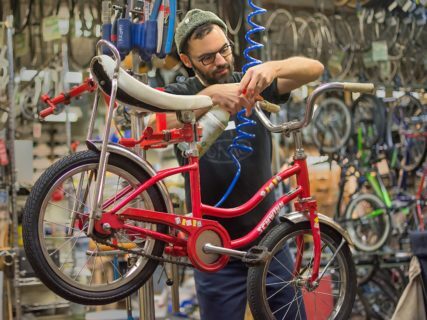 Join us as we refurbish kids’ bikes for the 2018 Holiday Bike Drive. Stop by on Sundays at for Sunday Salvage recycling work, or talk to us about becoming a guest mechanic or wheels specialist during the week. There’s a place for you here. Thank you, volunteers. We love you.